We have clues about what might replace it. 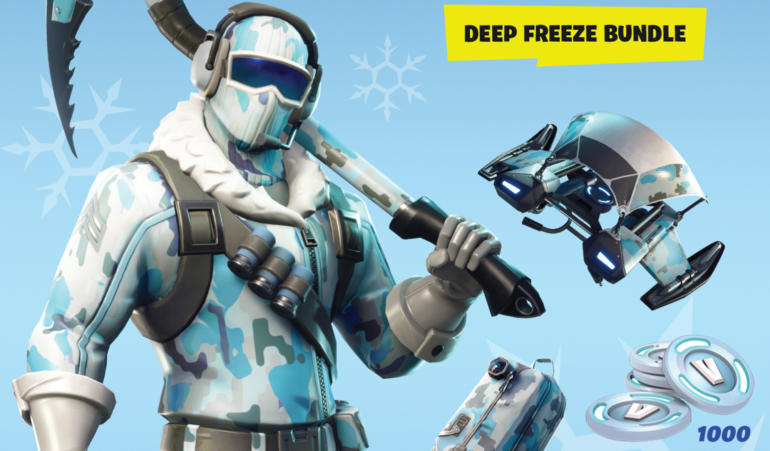 This bundle comes with the Frostbite outfit, the Freezing Point back bling, the Chill-axe pickaxe, the Cold Front glider, and 1,000 V-bucks for $29.90. This pack was initially set to be sold along with PS4, Xbox One, and Nintendo Switch consoles that came with Fortnite pre-installed. Epic was fast to add the items to the Shop and to let players on all platforms buy the bundle separately as well. The Deep Freeze bundle was very different from previous cosmetic bundles. It came with more items, such as a glider and a pickaxe, and with 1000 V-Bucks instead of the usual 600 V-Bucks from Starter Packs. But its price was considered high by many players when compared to that of Starter Packs, which usually cost around $5. Now that the Deep Freeze bundle is leaving the Store, Epic is ready to add a new bundle to replace it. The company has yet to announce what players will be able to get instead of this winter-themed bundle, but leakers revealed that it might be the Cobalt Starter Pack. We might only be sure when Epic releases the 7.20 Content Update tomorrow.